This article is about toads. For the Finnish company, see Bufo (company). Bufo is a large genus of about 150 species of true toads in the amphibian family Bufonidae. Bufo is a Latin word for toad. True toads have in common stocky figures and short legs, which make them relatively poor jumpers. As with all members of the family Bufonidae, they lack a tail and teeth, and they have horizontal pupils. Their dry skin is thick and warty. Behind their eyes, Bufo species have wart-like structures, the parotoid glands. These glands distinguish the true toads from all other tailless amphibians. They secrete a fatty, white poisonous substance which acts as a deterrent to predators. Ordinary, handling of toads is not dangerous, and does not cause warts in contradiction to folk beliefs. The poison of most if not all toads contains bufotoxin; the poison of the Colorado River toad (Bufo alvarius) is a potent hallucinogen containing 5-MeO-DMT and bufotenin. The poison's psychoactive effects are said to have been known to pre-Columbian Native Americans. Toads can also inflate their bodies when threatened. Males are usually smaller than females and possess a Bidder's organ, an incomplete ovary. The adult male of many species shows a dark throat. Breeding males have dark nuptial pads on their thumbs. This is a truly cosmopolitan genus, able to live under adverse conditions, and occurring around the world except in the Arctic and Antarctic, Madagascar, Australia (with the exception of the introduced cane toad), and New Guinea and Oceania. Two species are found in the British Isles: the common toad (Bufo bufo), and the natterjack toad, (Bufo calamita). The former is found almost everywhere in Great Britain, but not in Ireland. The natterjack, which differs in its shorter limbs with nearly free toes (which are so short, the toad never hops but proceeds in a running gait) and in usually possessing orange or red warts, green eyes, and a pale-yellow line along the middle of the back, is local in England, the south-west of Scotland, and the west of Ireland. It is further remarkable for the very loud croak of the males, produced by a large vocal bladder on the throat which, when inflated, is larger than the head. Several species of Bufo toads produce poison with psychoactive properties. 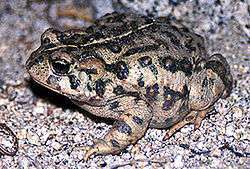 The poison of one species (Bufo alvarius) contains both 5-MeO-DMT and bufotenin, while some others contain only bufotenin. Author Lee B. Croft, in his satiric novel, Toadies: The Explanation of Toxicomania in American Society, has coined the word "bufoglossation" to describe the deliberate licking of Bufo toads for hallucinogenic purposes, but psychoactive substance information site Erowid warns against such use because of the cardiotoxins (bufadienolides) included in the toads' poison. Species in this genus can be quite different, which has led to a recent recommendation in the Bulletin of the American Museum of Natural History to split the genus, a recommendation that has been rejected (in part) by many taxonomists (see Pauly et al., 2004, Evolution 58: 2517–2535; Pauly et al., 2009, Herpetologica 65:115-128). Instead, the relationships between the different species are formalized by categorizing them into subgenera, such as Anaxyrus and Rhinella. Bufo is a large group, and it is usually divided into several subgenera. Frost et al. (2006) removed most of the species of former Bufo to other genera and restricted the name Bufo to members of the Bufo bufo group of earlier authors. However, other authors continue to recognize these subgroups of Bufo as subgenera. Rhinella is composed of a combination of Rhamphophryne and Chaunus (two subgroups of Bufo in the broad sense). Rhinella is recognized as a distinct genus by some, although other herpetologists disagree and maintain these species as a subgenus within Bufo. Here the species of Rhinella are treated in a separate page (where they may be considered a separate genus or as a subgenus of Bufo). Some authors recognize the Genus, Anaxyrus, as a subgenus of the Genus, Bufo. Anaxyrus contains 22 species found in North and Central America including the common American toad, A. americanus. Composed of 12 species, this subgenus is found in temperate Eurasia and Japan south to North Africa, the Middle East, northeastern Myanmar, and northern Vietnam. a fossil genus, Bufo linquensis lived during Miocene of China. This assemblage of 23 species remained outside the main groups. Frost et al. denoted the species in this group as polyphyletic by placing "Bufo" in quotation marks. Presumably, as these taxa are studied, they will be allocated to one or another of the existing groups. These four species were removed from the synonymy of Bufo by Frost et al., 2006. 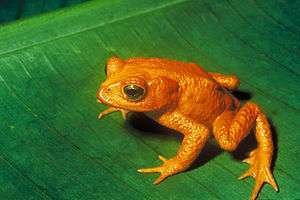 Smith and Chiszar, 2006, implied this taxon should be considered a subgenus of Bufo. They are found in South America. Containing 33 species, Frost et al. moved these members to a separate genus in 2006, first to Cranopsis, then to Ollotis, and then to Incilius. These 11 species are distributed in the Greater Antilles. 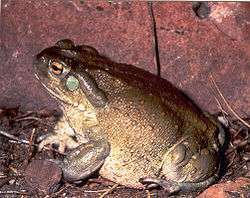 These two species were redelimited and removed from the synonymy of Bufo by Frost et al., 2006. Others implied this taxon should be considered a subgenus of Bufo. Frost et al. moved these 10 species in 2006 to a separate genus. Frost et al. moved Bufo calamita Laurenti, 1768, Natterjack toad, in 2006 to a separate genus; it is found in Europe. Frost et al. moved these 15 species in 2006 to a separate genus. It is the B. viridis group of previous authors. These eight species were redelimited and removed from the synonymy of Bufo by Frost et al., 2006. Others implied this taxon should be considered a subgenus of Bufo. These five species are the former B. angusticeps group of Tandy and Keith, 1972, placed by Frost et al. in a separate genus. ↑ Pauly et al., (2009). Herpetologica 65:115-128. "Amphibian Species of the World 5.1 - Bufonidae". Retrieved 2008-04-05. Frost, D. R.; Grant, T.; Faivovich, J. N.; Bain, R. H.; Haas, A.; Haddad, C. L. F. B.; De Sá, R. O.; Channing, A.; Wilkinson, M.; Donnellan, S. C.; Raxworthy, C. J.; Campbell, J. A.; Blotto, B. L.; Moler, P.; Drewes, R. C.; Nussbaum, R. A.; Lynch, J. D.; Green, D. M.; Wheeler, W. C. (2006). "The Amphibian Tree of Life". Bulletin of the American Museum of Natural History. 297: 1–291. doi:10.1206/0003-0090(2006)297[0001:TATOL]2.0.CO;2. hdl:2246/5781.